I have a theory about visits to the zoo – each visit delivers an exceptional experience viewing one particular animal. At various times we’ve seen otters frolicking at the water’s edge, bears standing on their hind legs for a stretch, seals playing tag and elephants finding carrots hidden by the keepers. I suspect that a visit to the Adelaide Zoo’s superb new Giant Panda exhibit will be an exceptional experience in itself. Designed by architects HASSELL, the Adelaide Zoo Giant Panda Forest is among the world’s leading exhibits for the endangered giant panda species. 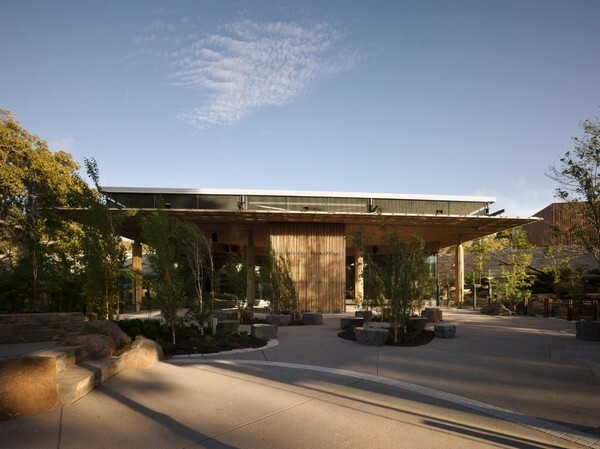 The architecture and landscaping puts the pandas’ native Chinese heritage within an Australian context. A series of pavilions provide views of the pandas and their habitat. The exhibit is carefully designed to balance the need to provide the pandas with choices, comfort and stimuli while providing management flexibility for keepers and excellent viewing access for visitors. A multi-species exhibit, the enclosure houses the male and female giant panda (Wang Wang and Funi) as well as red pandas and mandarin ducks. The pandas have access to two six hundred square metre outdoor exhibits as well as air-conditioned day rooms. A range of design features have been used to enrich the environment, particularly focusing on climate control – chilled rocks, streams and waterfalls for bathing, mature shade trees for climbing and glass reinforced concrete caves for shade and shelter create a comfortable and stimulating environment for the animals. I am planning a trip with my kids to see the pandas later in the year but we’d love to hear from readers who have already been fortunate enough to visit.